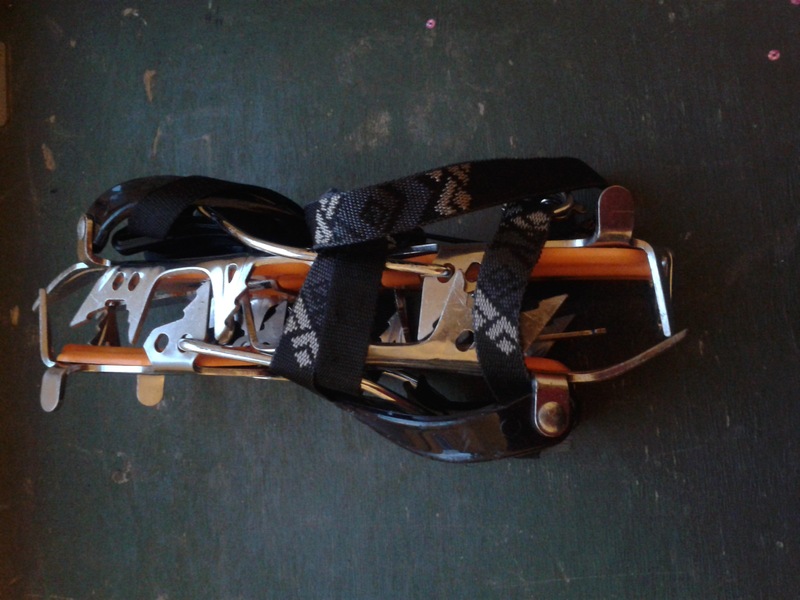 How should one carry crampons when not actually using it, but knowing that they are going to be needed in the further stage of the expedition. Further clarification: Suppose I am gonna need to have crampons on only in a certain stage of the expedition, and not all the way. What is the best possible safe way to carry them they don't damage my backpack? I am not in favor of tying them outside the pack, as they may get damaged and I personally don't like things tied to the pack when it can be avoided. Cut the top off a 2 liter soda bottle (use two bottles for full containment). Make or buy a heavy (e.g. 500D) cordura nylon bag. Cut off an old denim pant leg and slide them inside. Wrap them in a towel or similar padding. Nothing at all, just keep them away from anything especially delicate. Also keep in mind that while they may be nice and clean on the way in, coming out they will be muddy and slushy. My pack has a crampon patch and straps, so that's where I carry them. Just face the pointy bits towards each other and wrap the webbing around the bundle to keep them together. I then just chuck them in the bottom of my bag if I know I don't need them or in the top if I know I will. You could pad them with a hat, spare socks or what ever if you were worried about other more delicate items. Also even if they start out sharp once they've encountered a small amount of scrambling or walking up some moraine they're unlikely to be sharp enough to damage something unless you're being very forceful in your packing / unpacking. Not the answer you're looking for? Browse other questions tagged mountaineering gear-care crampons or ask your own question. Should you occasionally use locking biners on pieces of protection when using alpine draws? Higher weight carrying using forehead?